Michelle is new to us but has been a receptionist for 9 years. She is married to Keith and has lived in Davie County for 16 years. Michelle has five children, two cats, and one dog. Gabby has worked as a veterinary receptionist for almost 6 years. She joined AHED in April 2016. She is a big animal lover and has 2 cats of her own sunny and stormy. She currently lives in Clemmons with her family. Leigh has been with the practice for 13 years. Leigh is our practice manager, and she is vet tech as well. She enjoys working with the team and the animals. She has a dog name willow. She enjoys spending time with her son and husband in her free time, she also enjoys running and hanging out with friends. 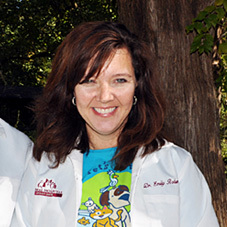 Emily Shelton has worked with Dr. Roberson for almost 20 years. They have moved through several practices and are great friends. Emily is a vet tech. She lives with her family, her cat Elvis, and her new Doberman puppy Hercules. Leah has been with the practice for five months. Leah works as a receptionist in the Davie Dog House and also works as a veterinary assistant for the practice. Leah recently go married and enjoys spending time with her husband and her new Brittany Spaniel puppy Ruger. Ashley just moved to the area from Maine to be closer to family after the birth of her son. Ashley has always had a passion for all animals and is excited to be part of a wonderful team. Briana has worked as a vet tech for about 3 years, she just joined the team here at AHED 4 months ago. Briana enjoys competing in rodeo’s and spending time with her dogs, rosie, sissy, diesel and her 5 horses. Emily Anne has worked with a variety of animals including, dogs, cats, raptors, and reptiles for the past 3 years. She has 2 dogs and 1 cat and spends as much time outside as she can. She is very excited to join the AHED Team.